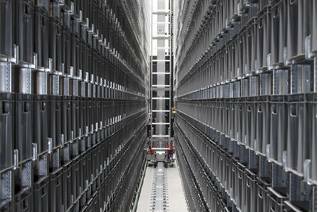 Live pallet racking (Gravity): Used for the FIFO system (First In, First Out), in which the loading area is at the opposite end to the unloading area, and the goods move along this space thanks to the inclined roller bed system. Push-back pallet racking. Mostly used for the LIFO system (Last In, First Out); this has only one loading and unloading point: the goods are stored by pushing the previous ones towards the back and they move along for unloading thanks to the inclination. 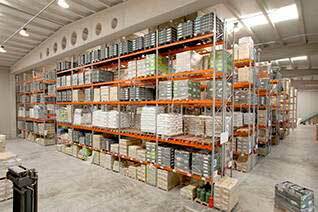 Live Pallet racking is the perfect high-density storage system for homogeneous pallets. 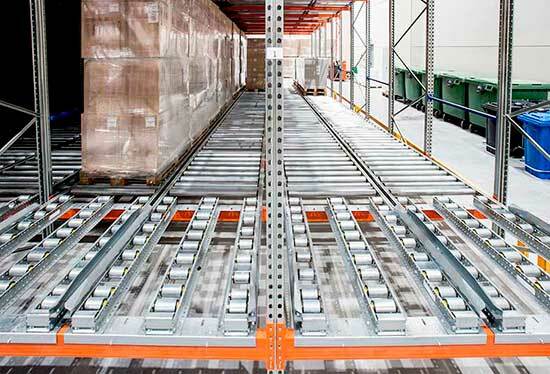 The Live pallet racking or dynamic pallet racking system is a compact structure with a slight incline and roller conveyors that allow palletised products to slide freely. Loaded pallets enter the structure on one end and move securely along the roller conveyors at a controlled speed, moved only by the force of gravity, until they reach the other end, ready for removal. 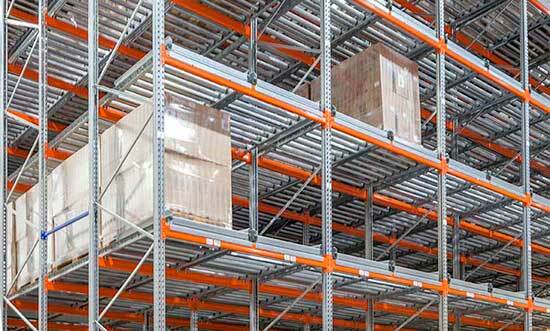 The movement of the load units in the live pallet racking systems AR LIVE STORAGE (PAL) is absolutely secure since the structure is equipped with a series of technical and organisational measures for control and protection. A push back system based on LIFO (last in-first out) warehouse management can also be installed. The main difference is that only one aisle is used for work as loading and unloading take place in the same area. The folding roller system allows roller conveyors to be moved and raised for cleaning and maintenance, and to access the warehouse floor, all this while maintaining the same technical characteristics and system operation. Split rollers can be installed in the loading and unloading areas of live pallet racking systems to simplify the work of forklift and pallet trucks. They also prevent roller damage. Sometimes warehouses with dynamic racking systems need the load units to be picked up at ground level. To simplify this operation, a special pallet output area can be added. 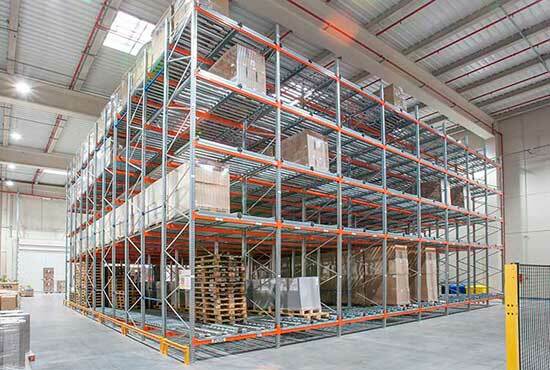 The Live Pallet Racking system has a basic structure of frames, uprights and dynamic profiles, similar to other storage systems in the AR Racking range. Together with the basic structure, this dynamic racking system also includes a large variety of specific elements for safe, controlled displacement of the load units. Storage of perishable goods requiring perfect turnover. Reduced loading and unloading times. 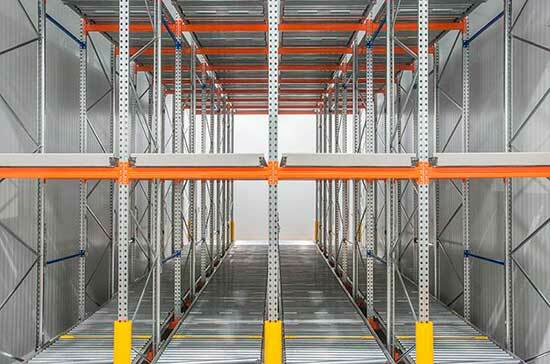 Increased storage capacity in a warehouse with adjustable pallet racking. Enabling of loading and unloading aisles reduces risks for the operator. 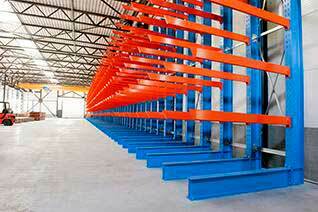 Live pallet racking system can be automated. Ideal product rotation: Perfect for FIFO systems (first-in, first-out). Fast, simple removal. Ideal positioning of the products reduces load manoeuvre and extraction times. No traffic interference. The forklift trucks insert and remove load units in different aisles since the loading and unloading aisles are separate. Adaptable to any space, and to any weight or size of the merchandise to be stored. Extremely safe. 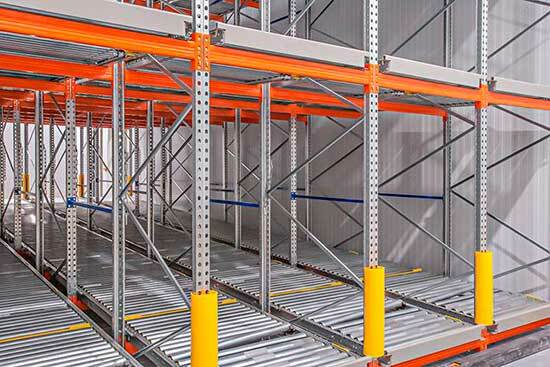 The Live pallet racking structure is fitted with a control and braking system to minimise any risks: brake rollers, pallet centring or retainer system, and pallet stops. Improved stock control since each loading aisle has a single product reference. 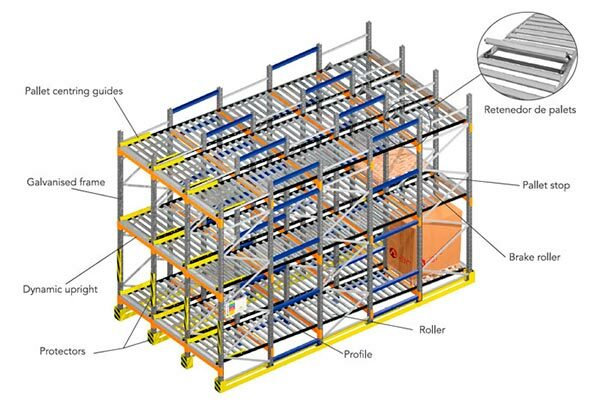 Dynamic pallet system is compatible with other automatic and conventional storage systems. 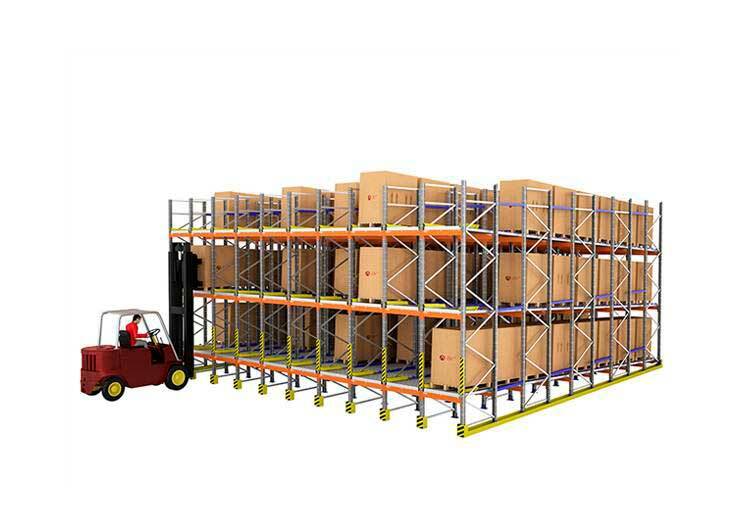 Allows you to continue to use the same type of forklift trucks used in adjustable pallet racking warehouses. Reduced operating costs thanks to excellent use of space. The uprights and frames of the AR range are pre-galvanised.